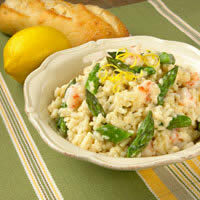 Seasoned Arborio rice with succulent rock shrimp are sure to satisfy any appetite. Bring chicken broth to a simmer; keep hot over lowest heat possible. In a large, heavy-bottomed saucepan, cook onion with butter, oil, and salt over medium-high heat until soft, about 5 minutes. Stir in rice to coat with the onion mixture; then stir in lemon zest. Add 1/2 cup simmering stock; stir frequently until broth has been absorbed. Add another 1/2 cup broth; stir frequently until broth has been absorbed. Continue to add broth in this manner until the rice appears creamy and the grains of rice have no uncooked starch inside when tasted. About 5 minutes before risotto is done, stir in asparagus and shrimp. Continue cooking until shrimp is pink and just firm. Add a bit more stock, if necessary, to achieve a creamy but not soupy consistency. Serve on warmed plates, and season with freshly ground black pepper to taste.